Following on from feedback obtained from the 2010 Nationals AGM the Rules and Tech committee have agreed a number of improvements and upgrades to the standard Hurricane hardware. The primary reasons were due to discontinuation of production of certain items and excessive cost increase on others. The time was right to allow some more up to date and reasonably priced enhancements to be introduced. Another purpose for this document is to clarify a number of previous rule upgrades offering a more defined interpretation direct from the Rules & Tech. 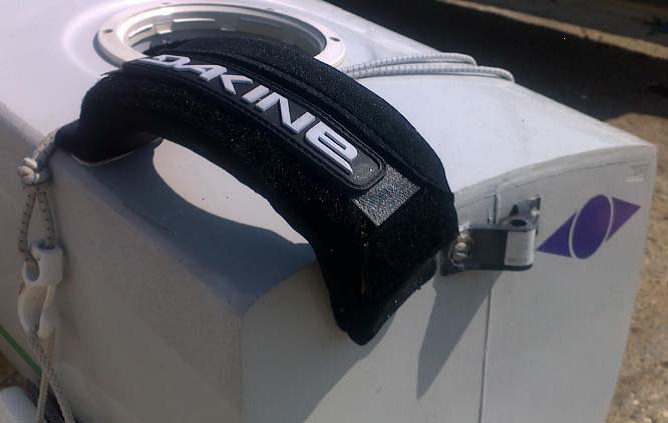 The existing 7:1 Harken system has served the class well for over 20 years. Production of these blocks has been discontinued. 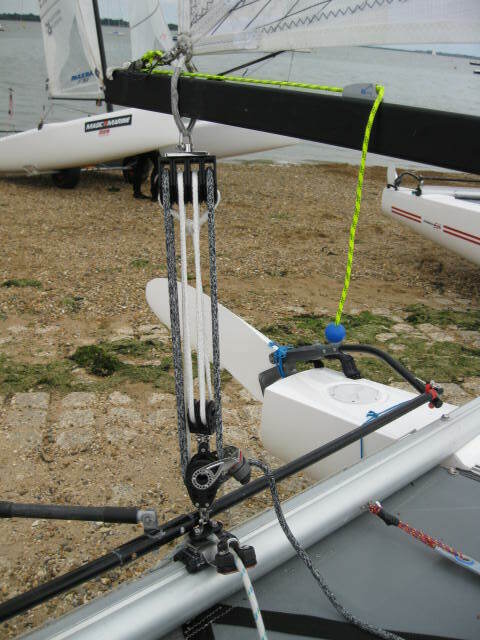 Harken have now been producing the carbo ratchet range for some years now, after trialling an 8:1 system and a 9:1 system a decision has been made to adopt the 9:1 system which offers a much smoother and more efficient sheeting action with smaller diameter sheaves and less weight than the original block system. 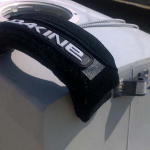 The recommended maximum purchase allowable has been set at 9:1, blocks manufactured by Harken, part numbers 2638, 2141, 2631. Please refer to AW sailboats pricing . 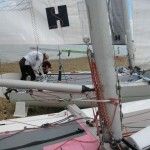 A past rule amendment allowed the owner the option of how they wished to attach their mainsheet to the boom, this still applies. 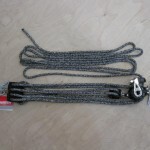 Methods can include rope or webbing strops, quick release shackles. 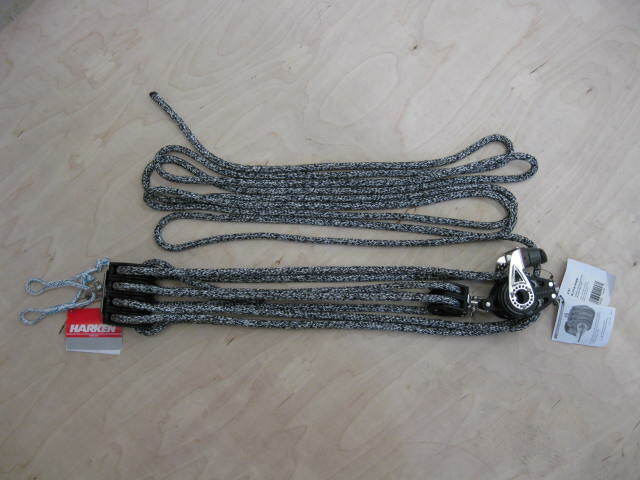 The requirement of a stainless steel attachment strap has been dropped. The stock supply of the original rectangular boom section dried up last season. It is no longer economical to purchase a stock of new extrusion from the boom section manufacturers. Having taken a look at what the majority of new cat design classes are using the natural choice was a tubular section. Having trialled a 1.75” tube it was decided that a 2 “ section would be more suitable for the class. 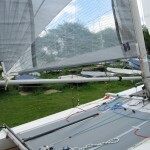 Taking into account the loads exerted using the standard pinhead sail sheeting position, the ease at which a smaller section will snap when landed on during a rare capsize (!) event and the ready supply of 2” section floating around most boat parks in the form of broken Laser boom/topmast sections the choice makes sense. You can simply by the custom made inboard boom end fitting which takes the existing gooseneck arm and fit out a 2.5m Laser section. Due to the variety of mast rotation systems within the class and both complex/ simple outhaul variations on other classes using tubes it has been decided to leave the options of fitting out the new boom section tube to the individual. 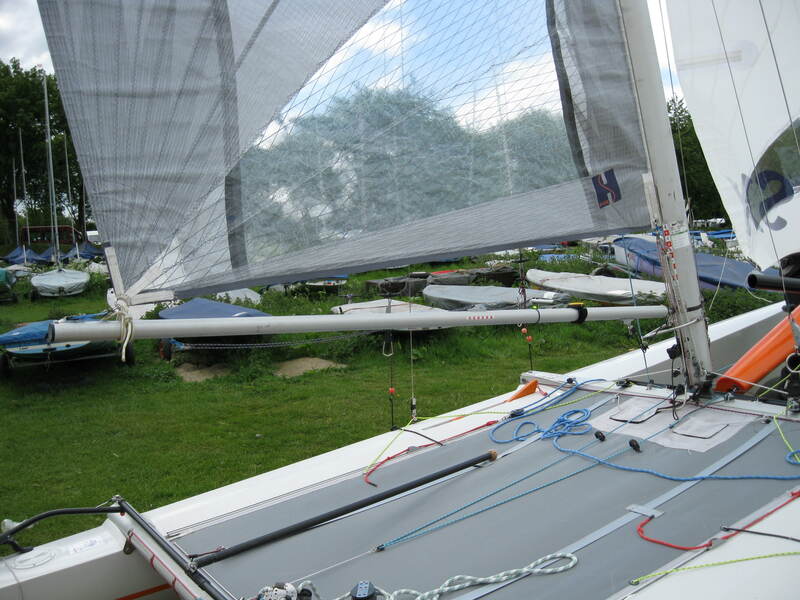 The rule governing mast rotation stated a maximum purchase of 5:1 which is still current, equipment optional. 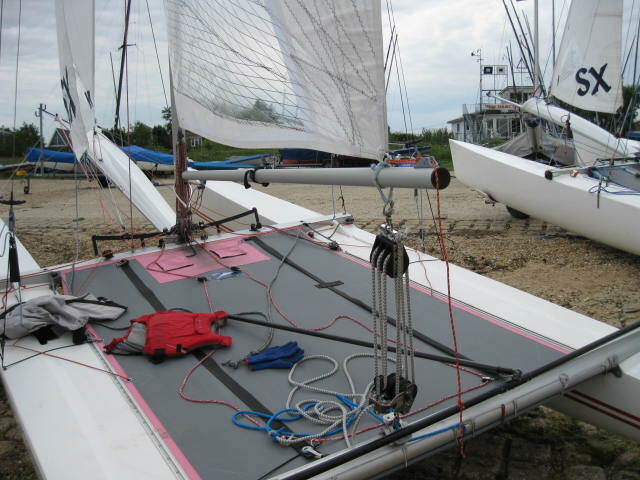 There have been a number of systems developing over the years, originally a straight to the boom/spanner cleat only, off the boom to a flip flop cleat on the back of the mast or down through the trampoline and out to the end of the main beam. They all have their benefits both in practicality and cost. The existing FX6 tiller extension has been a long standing tried and tested friend of the class. With increasing productions costs, a weak pound and increased shipping/import costs the time had arrived to take a look at an alternative. 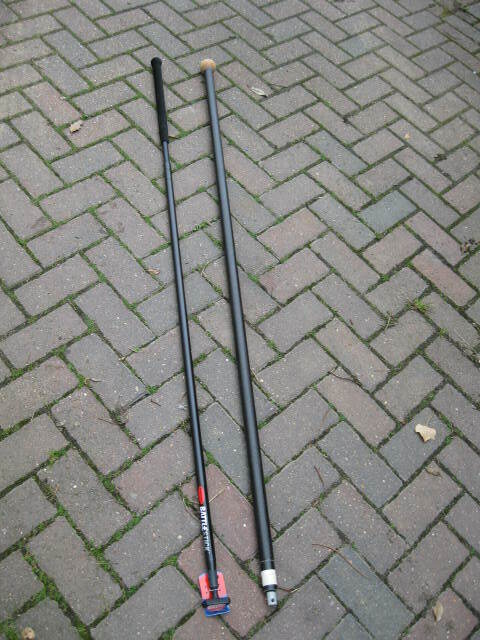 All carbon fibre manufactured telescopic offerings are extremely expensive, although lightweight they are extremely brittle shattering easily. These have been discarded by Rules and Tech for the time being. A halfway house has been trialled by two class national champions and is made of aluminium. This is the Ronstan manufactured Battlestick with and extendable range of 153 cms to 2249 cms. 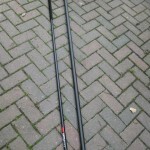 The stick has an Evalon grip on the outboard end of the tube together with a round end ball giving positive grip. The extension is exceptionally light at 485 grms and fitted with a urethane U.V. resistant U/J joint giving much more uniformed articulation compared to the original mechanical U/J. Ronstan part number RF3124. 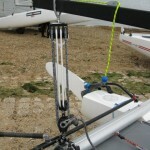 There is an optional mechanical U/J available which bolts straight on to the current tiller crossbar arrangement with will be more suited to those who like to constantly adjust the tiller length during the race. Part number RF1121. Providing the two parts are regularly flushed out with a hose and not stored over the winter all salted up the extension should last for quite some time. They will bend easier than the original FX6 but it is possible to gently persuade them back in to a reasonably straight form if you have a hiccup. At £85 they are a third of the price of a carbon offering. 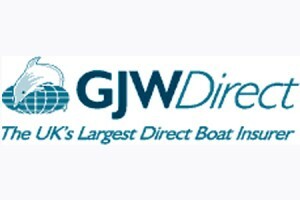 Only time on the boat will tell if they are a suitable all round alternative for everyone. 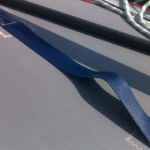 Class rules state that up to two webbing reinforced footstraps per hull are allowable. Rules and tech have agreed that any of these foot loops can be placed on the trampoline as well as the deck edge. Providing they are made using a webbing reinforced material, the design is optional. The upgrade to a 16:1 downhaul system was agreed two seasons ago. 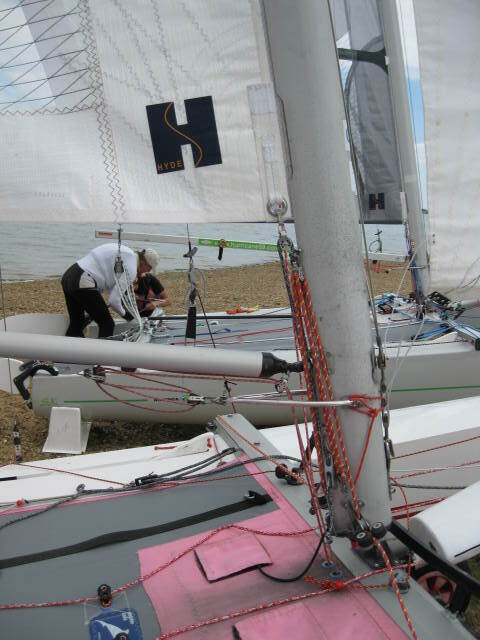 There is a standard kit available from AW Sailboats utilising Harken hardware. The Rules and Tech did not stipulate the exact specification other than a maximum purchase of 16:1 . 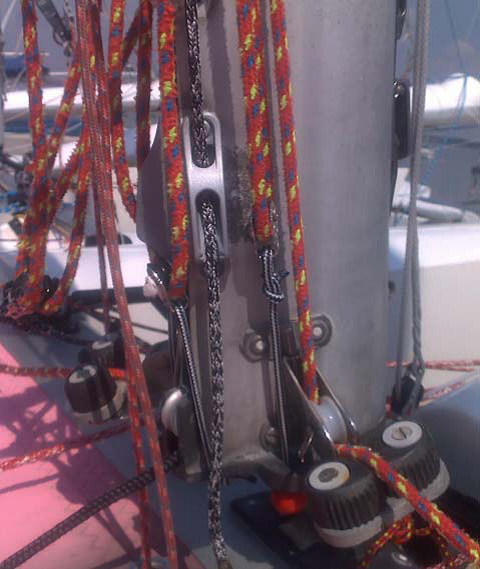 Variants to the system such as addition cleats to allow a course adjustment of the system are allowable but users are warned that there is a risk of rope failure and to be aware of applying too much downhaul leading to serious damage of the mainsail. The original class supplier specified kit is deemed to be the most suitable and cost effective. 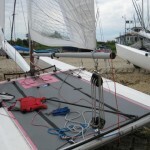 The original concept of the SX kit was to allow the rig to be changed back to two sail mode quickly and efficiently. Due to the success of the SX rig it is clear that only a minority actually carry out this exercise. 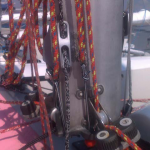 Rules & Tech have agreed that there is no longer a requirement to carry barbour hauler fittings or shroud adjuster plate mounted jib cleats when in SX rig mode. 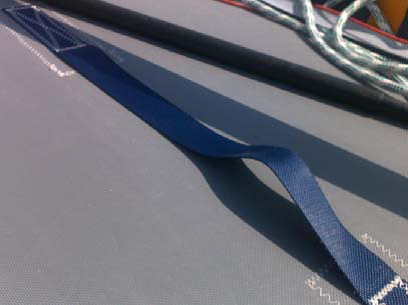 The removal of the crew reaching line system is also permitted to facilitate the attachment of foot straps to the transom. Please contact Andy Webb via info@awsailboats.co.uk for further information or to place an order for any of the items listed below.